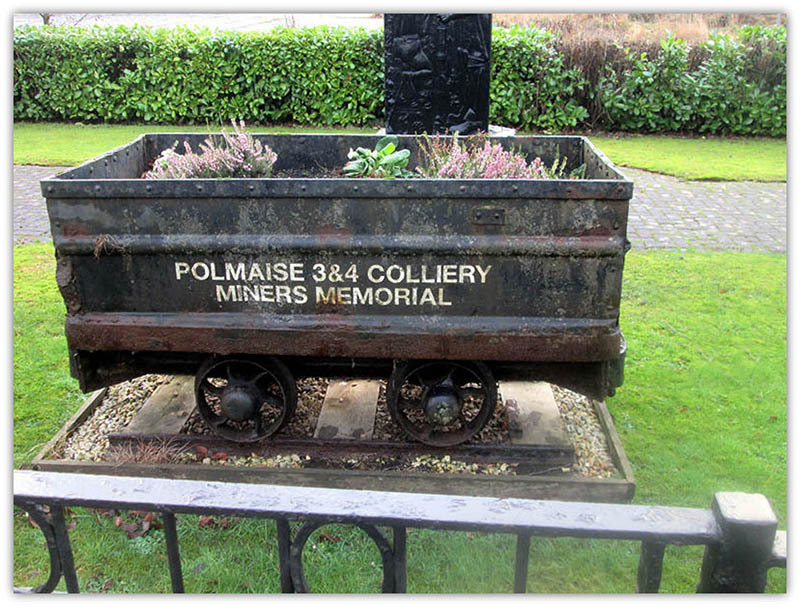 Polmaise 3 and 4 Colliery, Fallin, Stirlingshire. 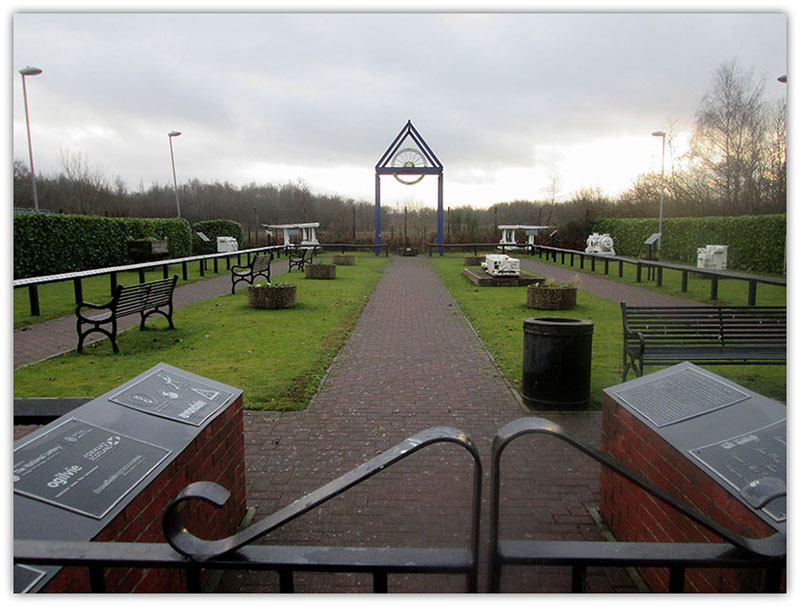 Views to left and right of central pathway to 'A' Frame. Panels on Left Hand Side of gate are sponsors panels. 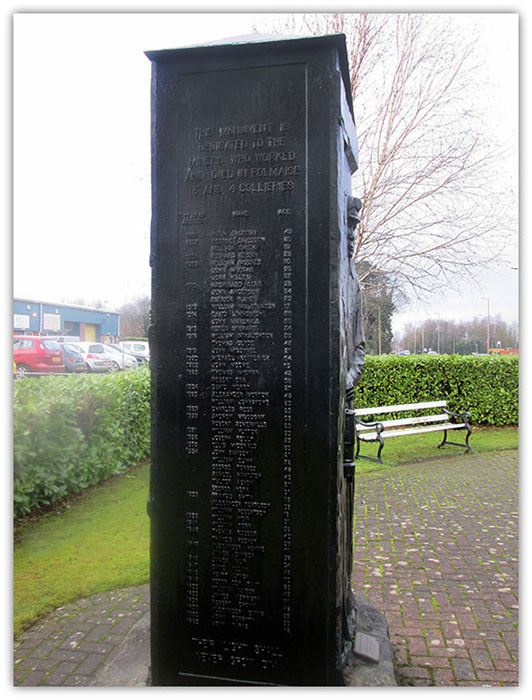 The memorials at the base of the 'A' frame are to local men - no mining link given. In the year 1901, Archibald Russell Ltd surveyed the Fallin area for coal, and struck a rich seam. 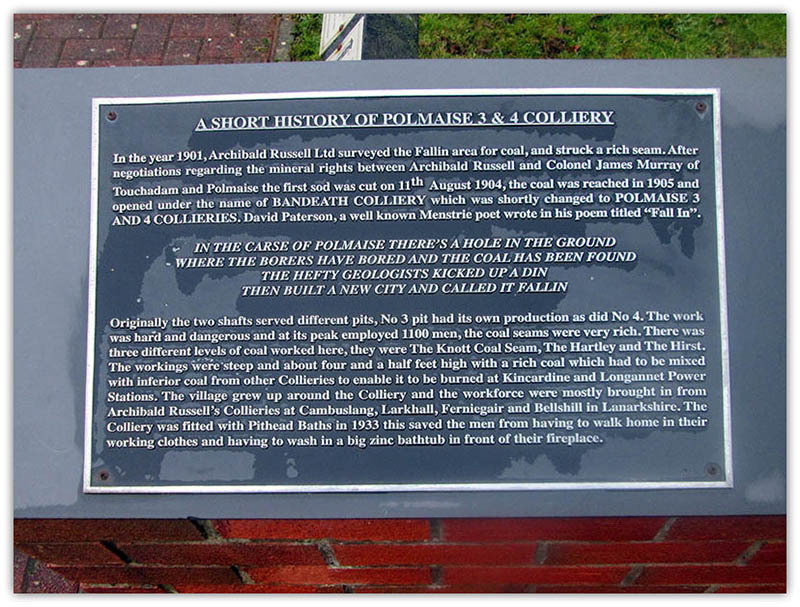 After negotiations regarding the mineral rights between Archibald Russell and Colonel James Murray of Touchadam and Polmaise the first sod was cut on 11th August 1904, the coal was reached in 1905 and opened under the name of BANDEATH COLLIERY which was shortly changed to POLMAISE 3 AND 4 COLLIERIES. 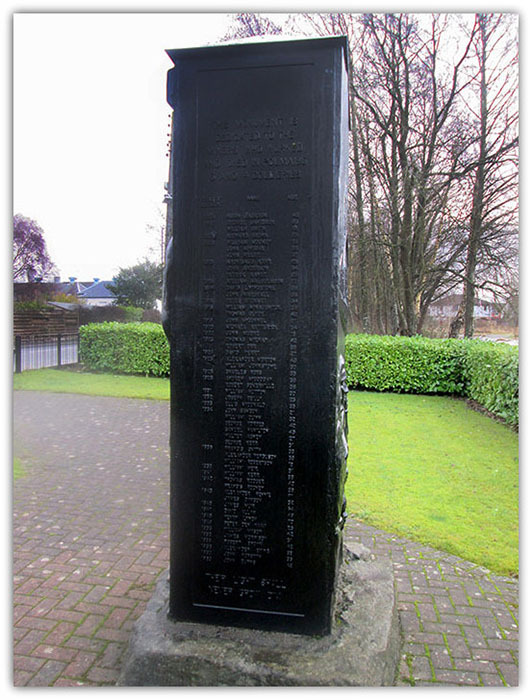 David Paterson, a well known Menstrie poet wrote in his poem titled “Tall In”. 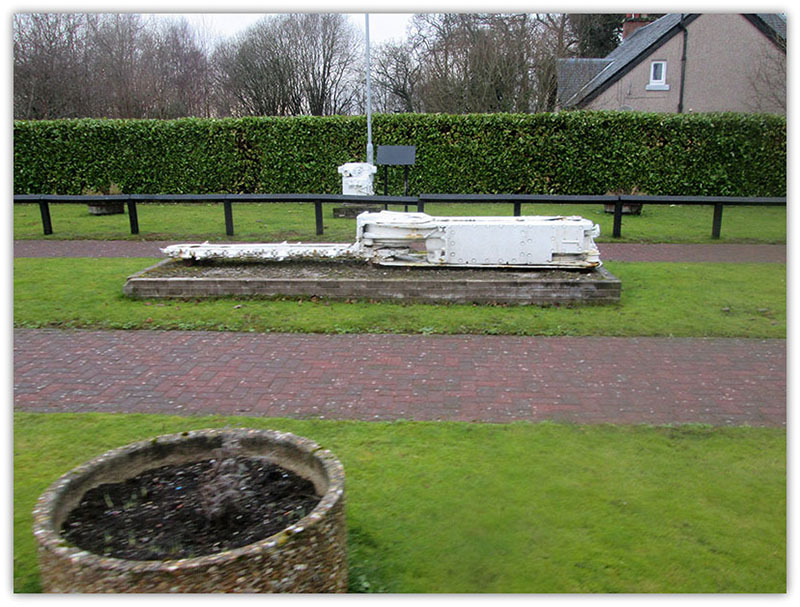 Originally the two shafts served different pits, No 3 pit had its own production as did No 4. The work was hard and dangerous and at its peak employed 1100 men, the coal seams were very rich. 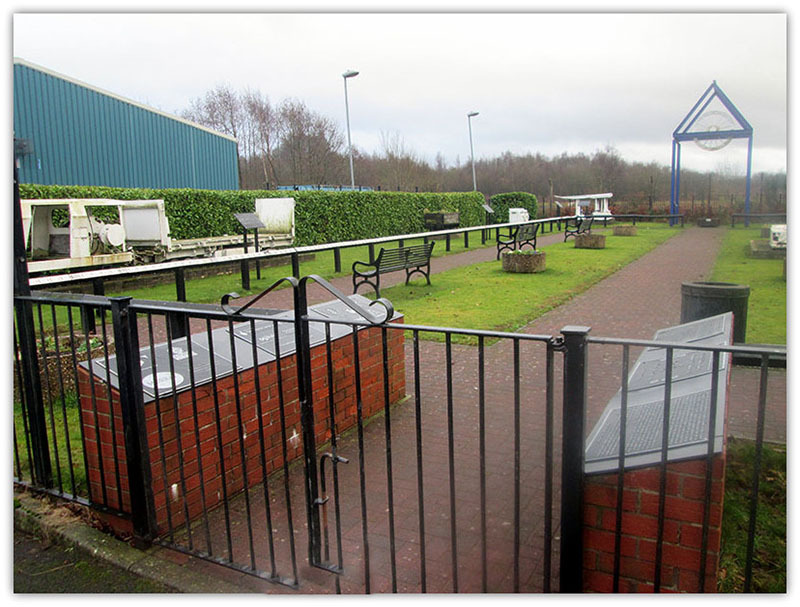 There was three different levels of coal worked here, they were The Knott Coal Seam, The Hartley and The Hirst. 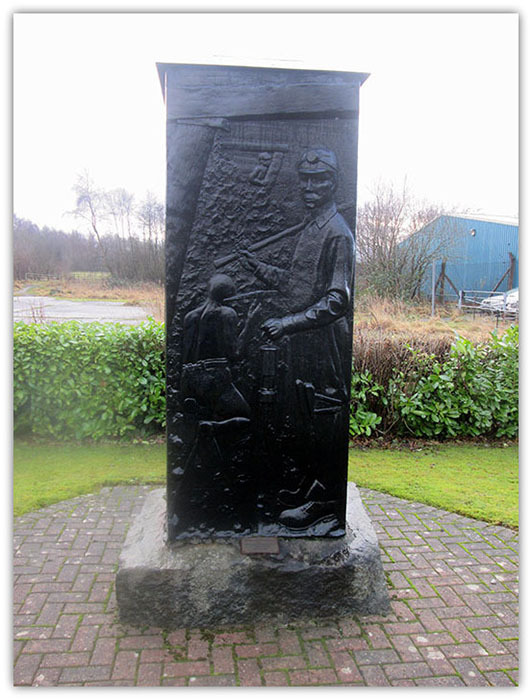 The workings were steep and about four and a half feet high with a rich coal which had to be mixed with inferior coal from other Collieries to enable it to be burned at Kincardine and Longannet Power Stations. 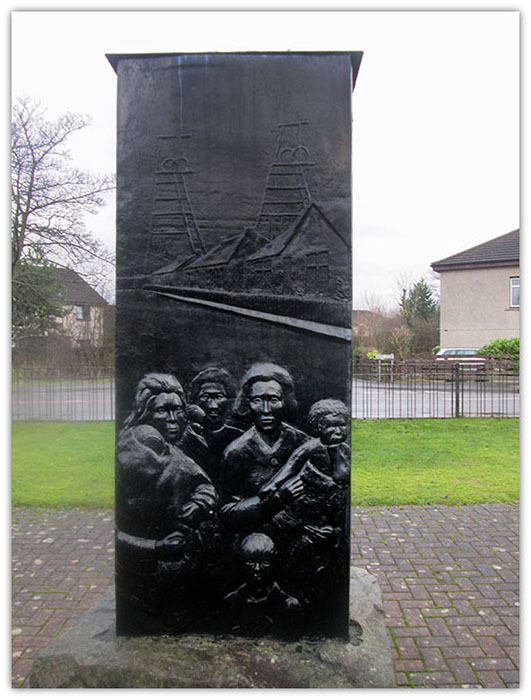 The village grew up around the Colliery and the workforce were mostly brought in from Archibald Russell’s Collieries at Cambuslang, Larkhall, Ferniegair and Bellshill in Lanarkshire. 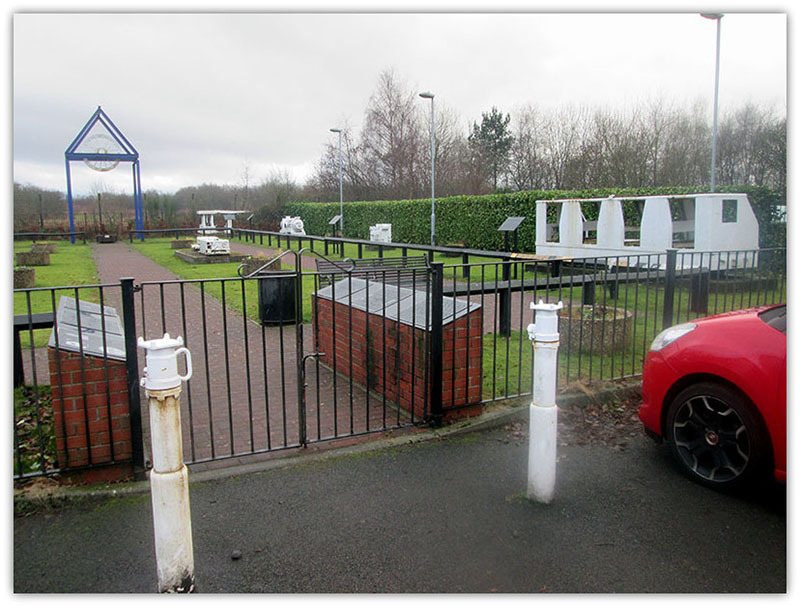 The Colliery was fitted with Pithead Baths in 1933 this saved the men from having to walk home in their working clothes and having to wash in a big zinc bathtub in front of their fireplace. 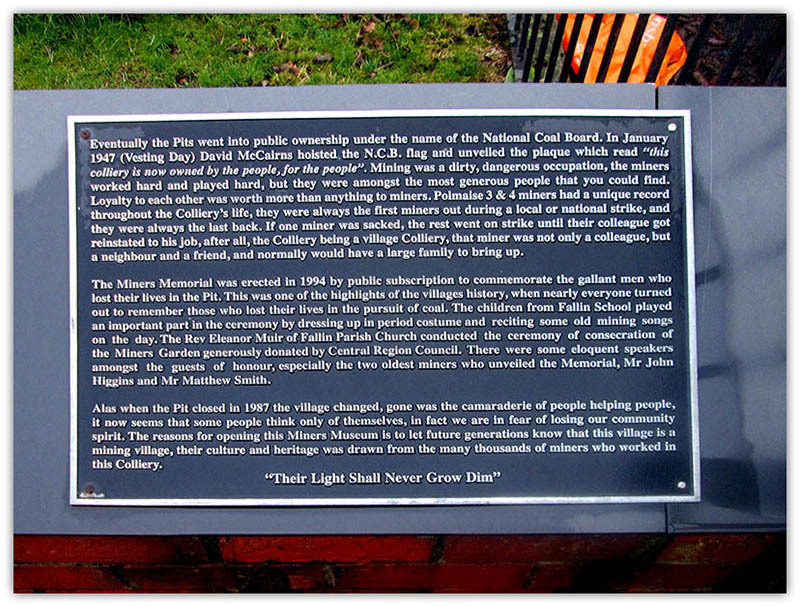 Eventually the Pits went into public ownership under the name of the National Coal Board. In January 1947 (Vesting Day) David McCairns hoisted, the N.C.B. flag and unveiled the plaque which read “this colliery is now owned by the people, for the people”. Mining was a dirty, dangerous occupation, the miners worked hard and played hard, but they were amongst the most generous people that you could find. Loyalty to each other was worth more than anything to miners. 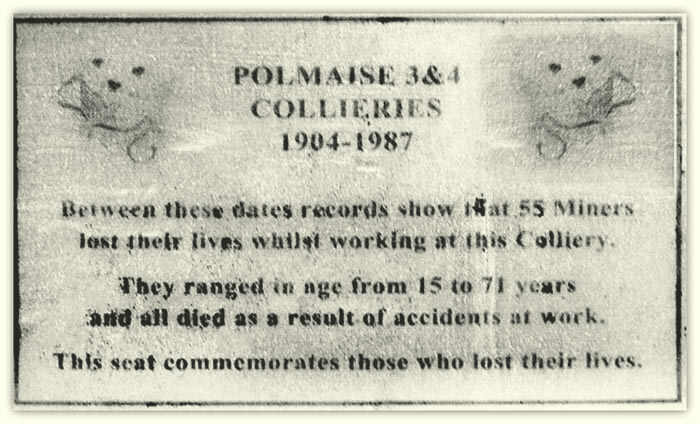 Polmaise 3 & 4 miners had a unique record throughout the Colliery’s life, they were always the first miners out during a local or national strike, and they were always the last back. 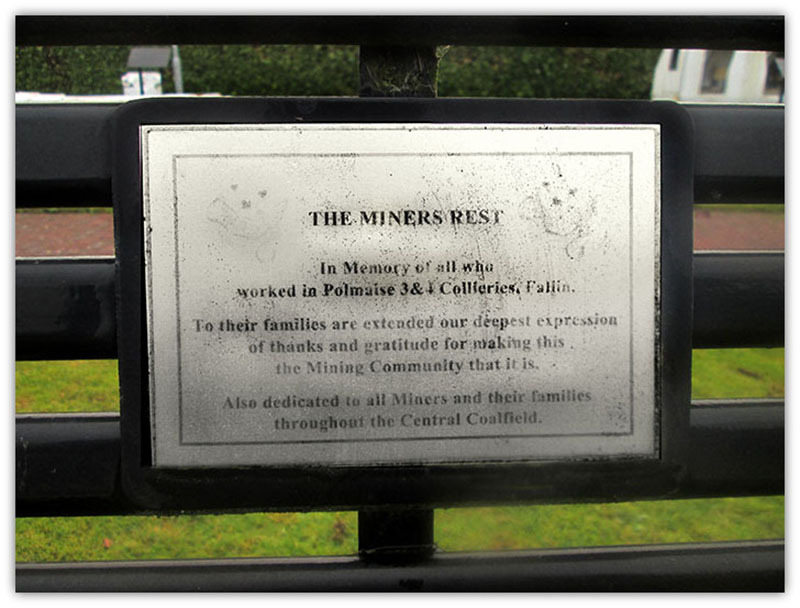 If one miner was sacked, the rest went on strike until their colleague got reinstated to his job, after all, the Colliery being a village Colliery, that miner was not only a colleague, but a neighbour and a friend, and normally would have a large family to bring up. 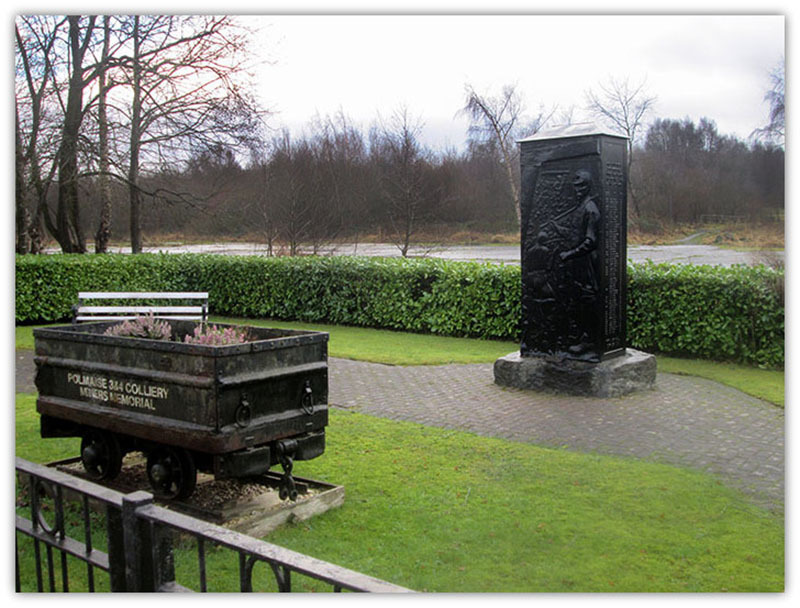 The Miners Memorial was erected in 1994 by public subscription to commemorate the gallant men who lost their lives in the Pit. This was one of the highlights of the villages history, when nearly everyone turned out to remember those who lost their lives in the pursuit of coal. The children from Fallin School played an important part in the ceremony by dressing up in period costume and reciting some old mining songs on the day. 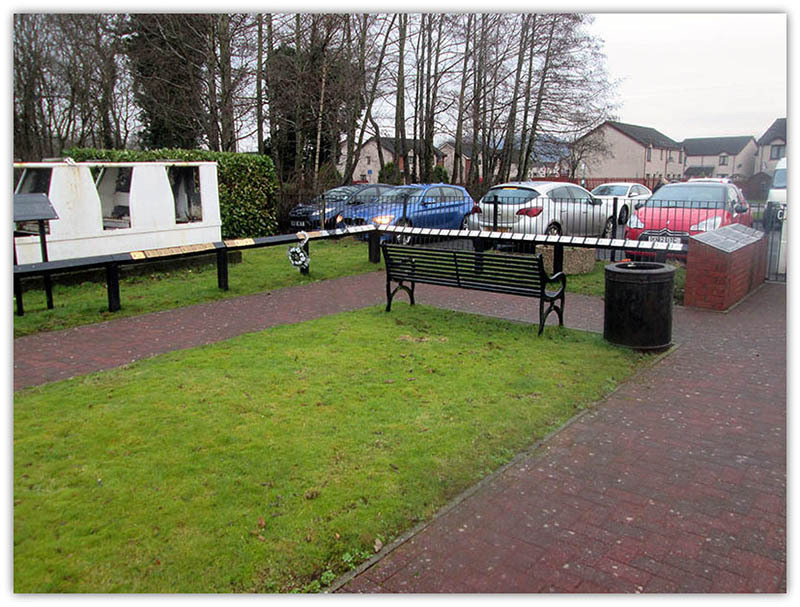 The Rev Eleanor Muir of Fallin Parish Church conducted the ceremony of consecration of the Miners Garden generously donated by Central Region Council. 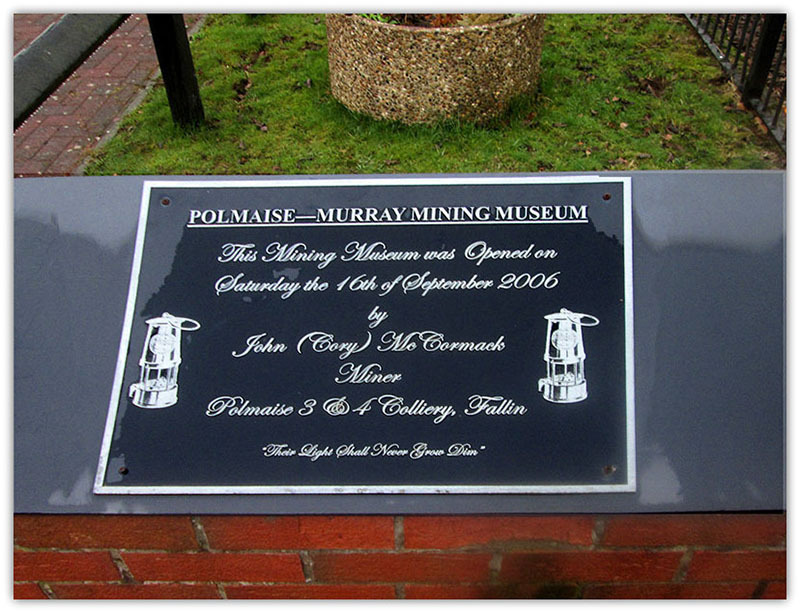 There were some eloquent speakers amongst the guests of honour, especially the two oldest miners who unveiled the Memorial, Mr John Higgins and Mr Matthew Smith.